Samuel Loyd (January 30, 1841 - April 10, 1911), born in Philadelphia and raised in New York, was an American chess player, chess composer, puzzle author, and recreational mathematician. As a chess composer, he authored a number of chess problems, often with interesting themes. At his peak, Loyd was one of the best chess players in the US, and was ranked 15th in the world, according to chessmetrics.com. He played in the strong Paris 1867 chess tournament (won by Ignatz von Kolisch) with little success, placing near the bottom of the field. 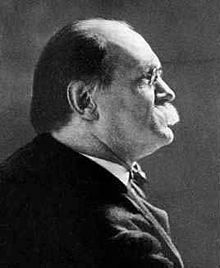 Following his death, his book Cyclopedia of 5000 Puzzles was published (1914) by his son. His son, named after his father, dropped the "Jr" from his name and started publishing reprints of his father's puzzles. Loyd (senior) was inducted into the US Chess Hall of Fame. Loyd is widely acknowledged as one of America's great puzzle-writers and popularizers, often mentioned as the greatest - Martin Gardner called him "America's greatest puzzler", and The Strand in 1898 dubbed him "the prince of puzzlers". As a chess problemist, his composing style is distinguished by wit and humour. However, he is also known for lies and self-promotion, and criticized on these grounds - Martin Gardner's assessment continues "but also obviously a hustler". Canadian puzzler Mel Stover called Loyd "an old reprobate", and Matthew Costello called him "puzzledom's greatest celebrity ... popularizer, genius", but also "huckster ... and fast-talking snake oil salesman". He collaborated with puzzler Henry Dudeney for a while, but Dudeney broke off the correspondence and accused Loyd of stealing his puzzles and publishing them under his own name. Dudeney despised Loyd so intensely he equated him with the Devil. 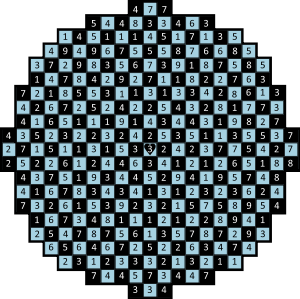 Sam Loyd did not invent the 15 puzzle and had nothing to do with promoting or popularizing it. The puzzle craze that was created by the 15 Puzzle began in January 1880 in the US and in April in Europe. The craze ended by July 1880 and Sam Loyd's first article about the puzzle was not published until sixteen years later, January 1896. Loyd first claimed in 1891 that he invented the puzzle, and he continued until his death a 20 year campaign to falsely take credit for the puzzle. The actual inventor was Noyes Chapman, the Postmaster of Canastota, New York, and he applied for a patent in March 1880. An enthusiast of Tangram puzzles, Loyd published a book of seven hundred unique Tangram designs and a fanciful history of the origin of the Tangram, which was presented as true and has been described as "Sam Loyd's Most Successful Hoax". Sam Loyd's "Excelsior". Mate in 5, 2nd prize, Paris Tourney, 1867. See "Excelsior" for the solution. Loyd bet a friend that he could not pick a piece that didn't give mate in the main line, and when it was published in 1861 it was with the stipulation that white mates with "the least likely piece or pawn". One of the most famous chess problems by Loyd. He wrote on this problem: "The originality of the problem is due to the White King being placed in absolute safety, and yet coming out on a reckless career, with no immediate threat and in the face of innumerable checks". This problem was originally published in 1859. The story involves an incident during the siege of Charles XII of Sweden by the Turks at Bender in 1713. "Charles beguiled this period by means of drills and chess, and used frequently to play with his minister, Christian Albert Grosthusen, some of the contests being mentioned by Voltaire. One day while so engaged, the game had advanced to this stage, and Charles (White) had just announced mate in three." "Scarcely had he uttered the words, when a Turkish bullet, shattering the window, dashed the White knight off of the board in fragments. Grothusen started violently, but Charles, with utmost coolness, begged him to put back the other knight and work out the mate, observing that it was pretty enough. But another glance at the board made Charles smile. We do not need the knight. I can give it to you and still mate in four!" Who would believe it, he had scarcely spoken when another bullet flew across the room, and the pawn at h2 shared the fate of the knight. Grothusen turned pale. "You have our good friends the Turks with you," said the king unconcerned, "it can scarcely be expected that I should contend against such odds; but let me see if I can dispense with that unlucky pawn. I have it!" he shouted with a tremendous laugh, "I have great pleasure in informing you that there is undoubtedly a mate in 5." In 1900, Friedrich Amelung pointed out that in the original position, if the first bullet had struck the rook instead of the knight, Charles would still have a mate in six. 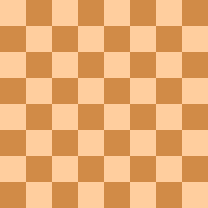 In 2003, ChessBase posted a fifth variation, attributed to Brian Stewart. After the first bullet took out the knight, if the second had removed the g-pawn rather than the h-pawn, Charles would be able to mate in ten. One of Loyd's notable puzzles was the "Trick Donkeys". It was based on a similar puzzle involving dogs published in 1857. 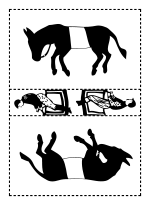 In the problem, the solver must cut the drawing along the dotted lines and rearrange the three pieces so that the riders appear to be riding the donkeys. Start from that heart in the center and go three steps in a straight line in any one of the eight directions, north, south, east or west, or on the bias, as the ladies say, northeast, northwest, southeast or southwest. When you have gone three steps in a straight line, you will reach a square with a number on it, which indicates the second day's journey, as many steps as it tells, in a straight line in any of the eight directions. From this new point when reached, march on again according to the number indicated, and continue on, following the requirements of the numbers reached, until you come upon a square with a number which will carry you just one step beyond the border, when you are supposed to be out of the woods and can holler all you want, as you will have solved the puzzle.